ashlee nicole spills | blog: Weezy Thanx You. If you thought you've heard the last of Lil Wayne until his release date, guess again. 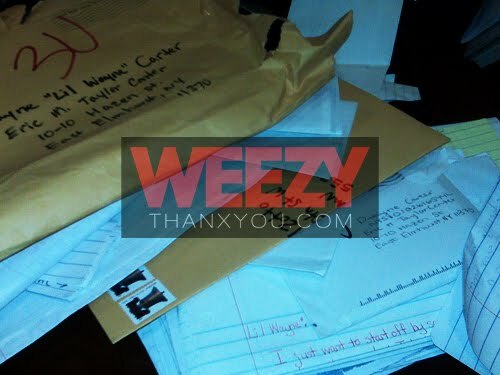 WeezyThanxYou.com is Lil Wayne's new blog that gives him a chance to reach out to his fans and respond to his fan mail. Love. Live. Life. Proceed. Progress. That’s who I am and who I’ll always be. You see, we’re all living on borrowed time, so I’m not worried about this situation. Life happens quick. The more time you spend contemplating what you should have done…you lose valuable time planning what you can and will do. Trying to tear down the past prohibits you from building up your future. So for my time here, my physical will be confined to the yard. My love and my spirit, however, know no boundaries. I’m in good spirits man, for real. My kids race through my mind all day. They know they were created with love, so love is how their life will be defined. I just hope my love and adoration for them provides a temporary bandage on a wound I unknowingly inflicted on them. Real soon, you can catch me blogging for ESPN again thank you espn for not letting my passion for sports perish. I work out a lot because it helps pass the time. I read the Bible everyday. Jail didn’t make me find God, He’s always been there. They can lock me up, but my spirit and my love can never be confined to prison walls. But this isn’t all about me, you are the reason for this letter. It’s because of you Rebirth went gold when critics aborted it. It’s because of you Young Money is and will always be a movement. If the weight of the world is on your shoulders, I beg of you, place it on mine. That’s the least I could do for you, after all you have sacrificed for me. If I could, I’d write each one of you back. Because of this, my team and I have created a website where you can view my letters. Each week I’ll answer as many questions as I possibly can. He continues on with replies to some of his fan mail. Read the full post here. The website also counts down to his release date. Visit weezythanxyou.com to stay current with Wayne's situation, purchase your very own "Free Weezy" t-shirt, and more.